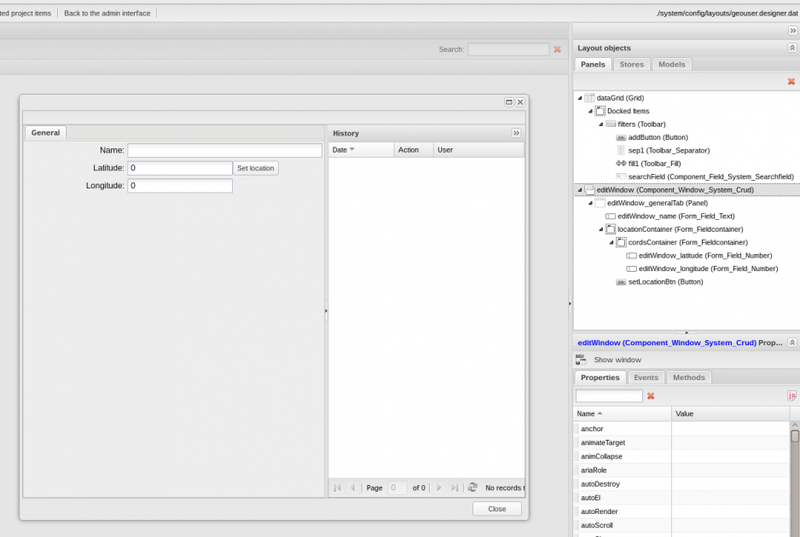 This case study demonstrates the platform new opportunities and provides an insight into object inheritance, method and event creation. 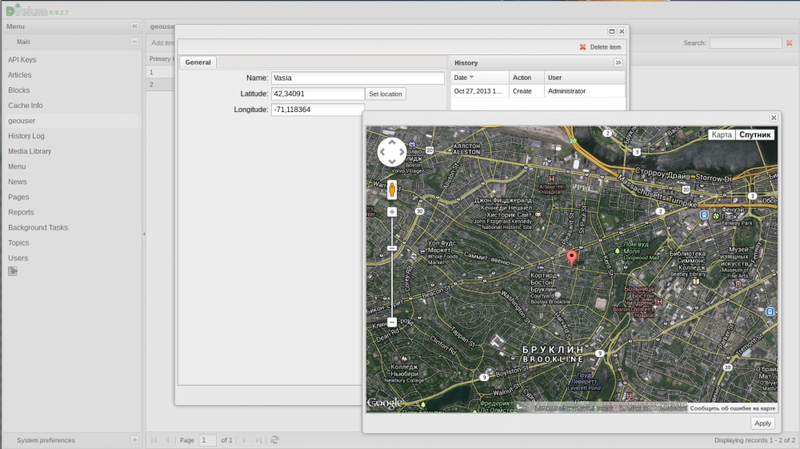 It also tackles some aspects of work with Google Maps API, as well as connecting external plugins and embedded projects. Let’s try implementing an interface, which contains a list of users with their geo location coordinates. The entry manager should allow indicating user name and geo location coordinates, while the geo location coordinates are added by click on the map. 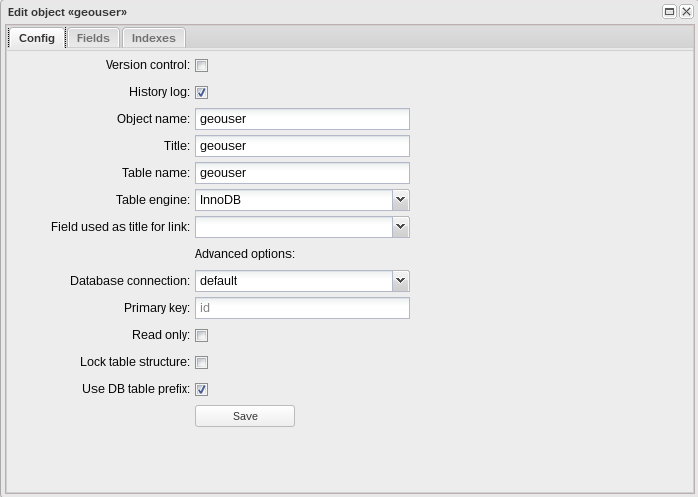 Enter the ORM management interface and create a new object - geouser, which will contain user name and geo location data in the following fields. 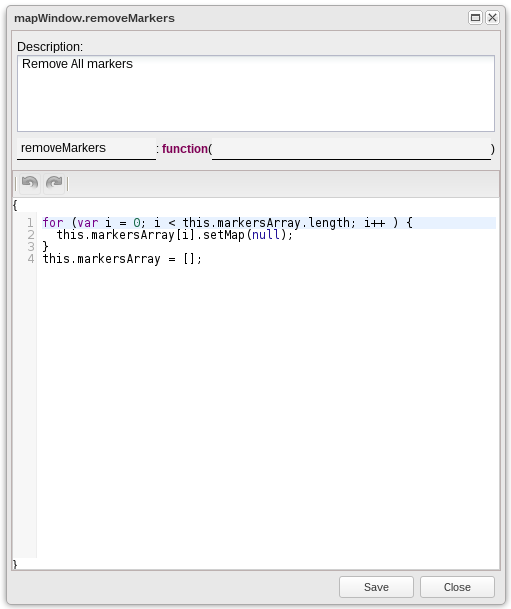 Now, you need to enhance the user editor so that coordinates could be added by click on the map. 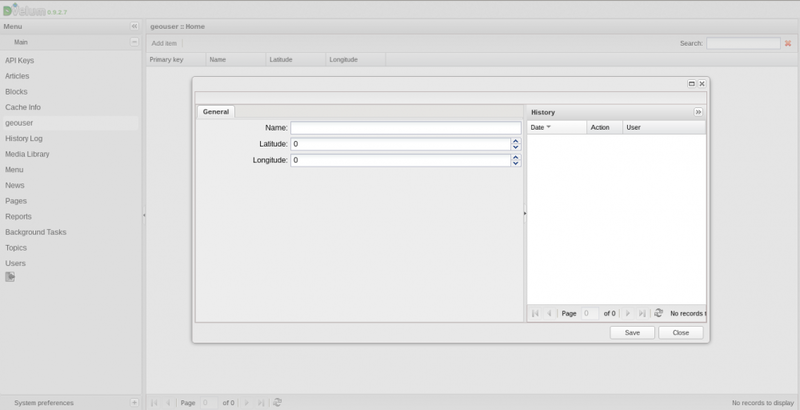 Using the Layout Designer, create an independent component, which will define the coordinates. 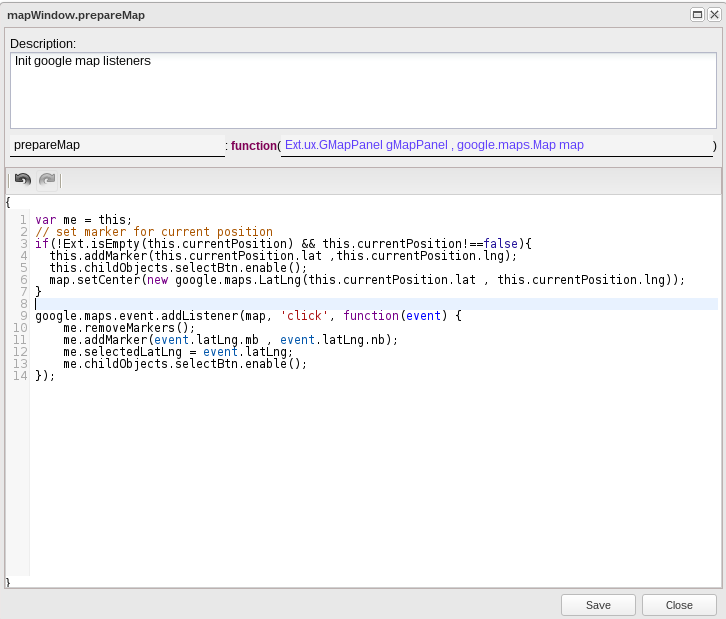 For working with maps, you’ll need JS plugin, which is already there in the system - js/lib/ext4/ux/GMapPanel.js. 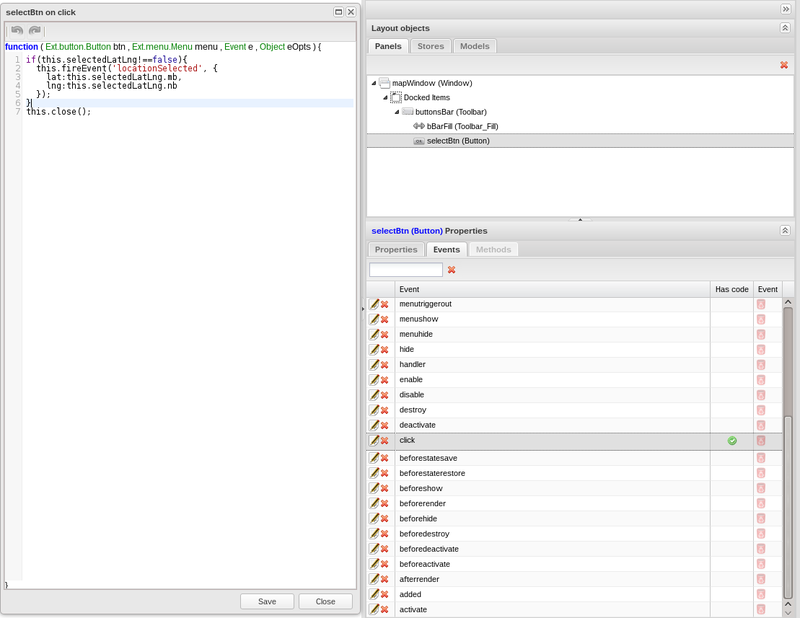 Connect it to the project (see the related documentation here: http://docs.sencha.com/extjs/4.1.3/#!/api/Ext.ux.GMapPanel). 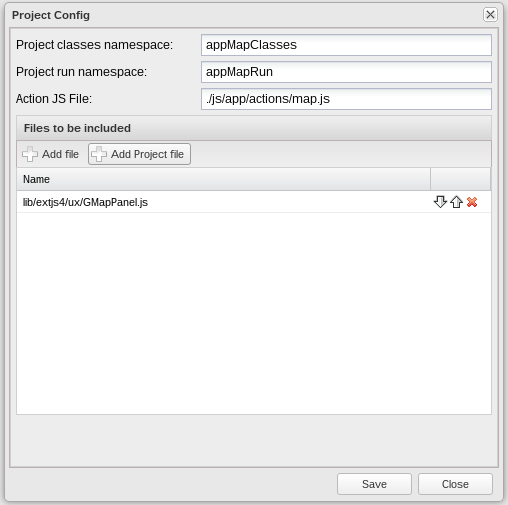 Add a window to the project and name “mapWindow”. Use the platform new opportunities and declare the window to inherit from Ext Window. To do so, set the property isExtended to true, thus making it possible to define the inherent events and methods. Change the layout property as well: layout: fit. Now, you need to add the component displaying the map to the window. As the Designer doesn’t have such a component, you’ll need to initialize in manually. 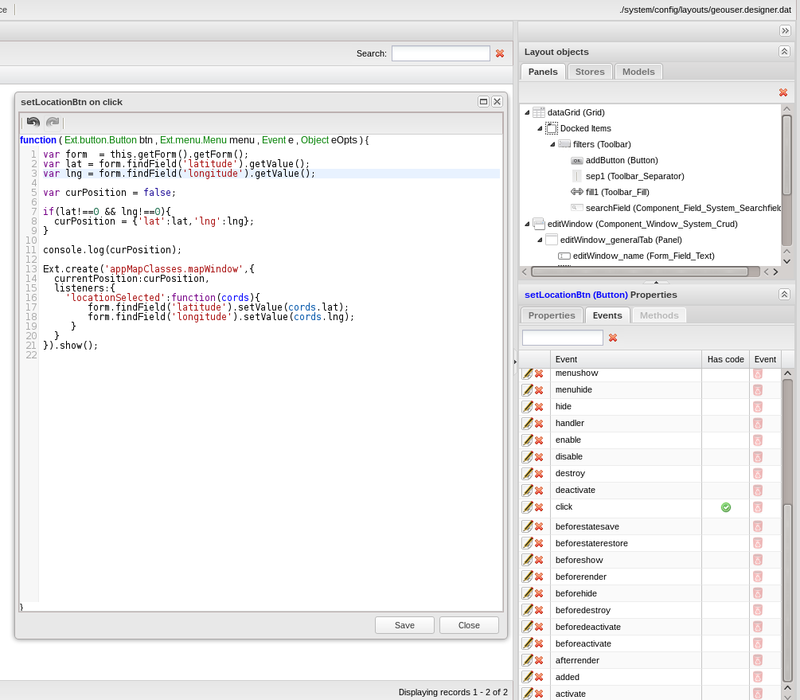 Now, we need to initialize the UX-component and add several methods to the mapWindow. 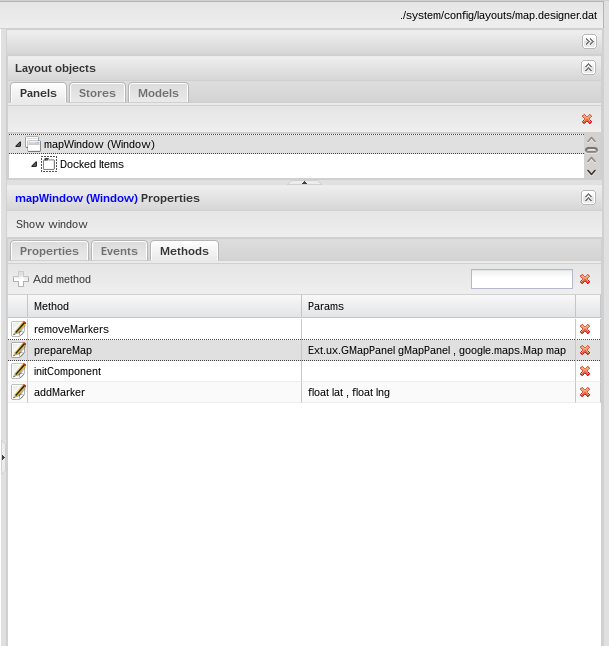 Redefine the initComponent method of the mapWindow. Get to the methods tab of the property panel and press the “Add Method” button. 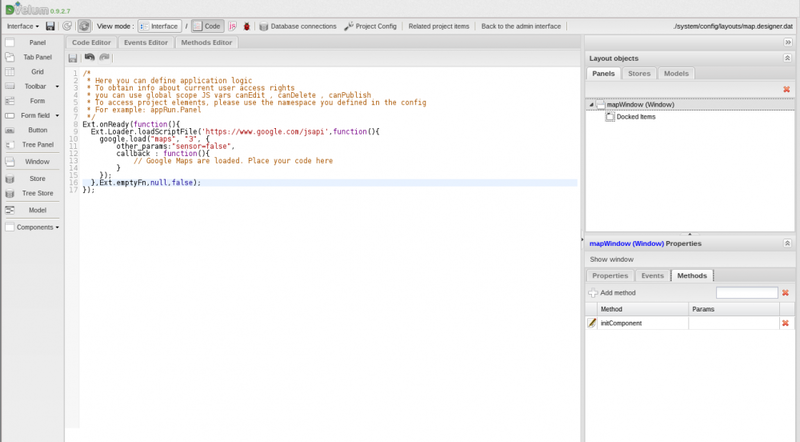 Specify initComponent in the window requesting the name of the new method. 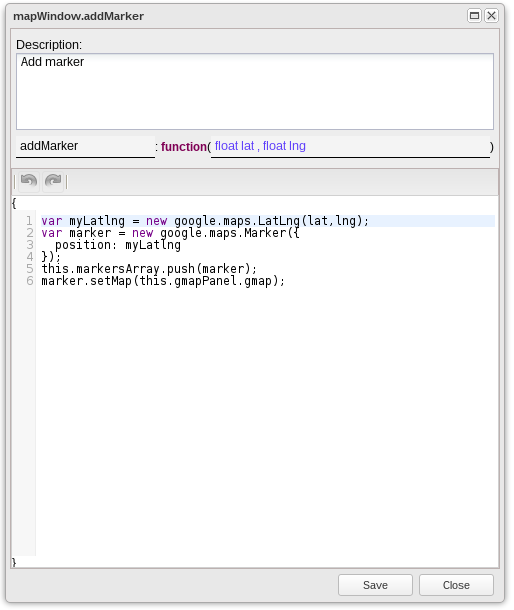 Add prepareMap system method, which is invoked after initializing the map (method calling has been described in initComponent). Add the button selecting the current position. 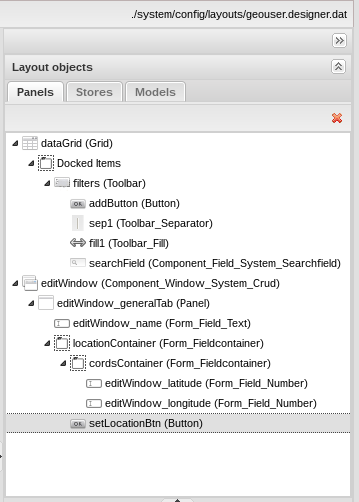 Place the toolbar-> Fill component as a child element of the buttonsBar and name it bBarFill. 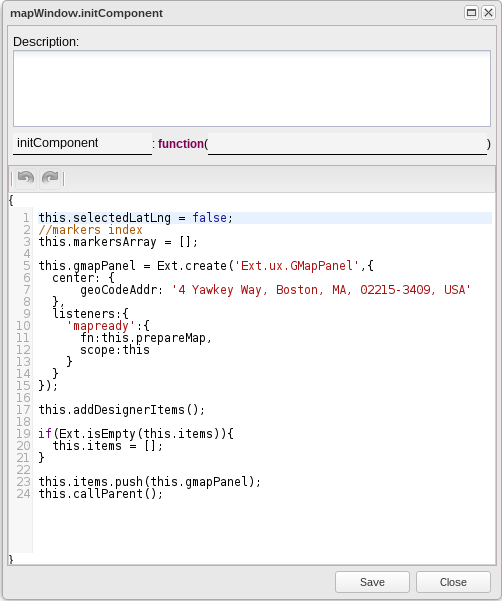 Place the Button component as a child element of the buttonsBar and name it selectBtn. The text will display on the button as per the localization settings (dictionaries may be reviewed in the system/lang/ [en.php / ru.php] directory). 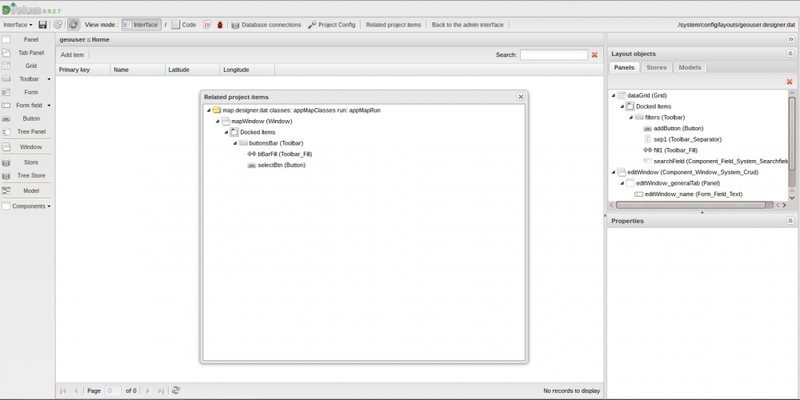 So, it is easy to create localized versions of the Layout Designer projects. Add event handler for the click on the selection button. This code checks if any coordinates have been selected. If they have, throw the 'locationSelected' event and pass the coordinates of the last selected point. The event will be described below. Once the button handler is added, declare the ‘locationSelected’ event so that listeners can be added to it. This is another new system opportunity - creating your own events for extended components. 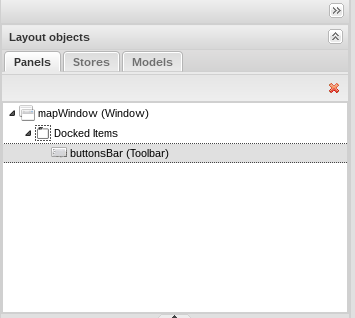 Open the mapWindow properties and switch to the Events tab. Click “Add Event” and indicate ‘location selected’ in the name field. As we don’t need an event handler, just close the Edit event window at the end. The Map component has been created. Save and close the project. 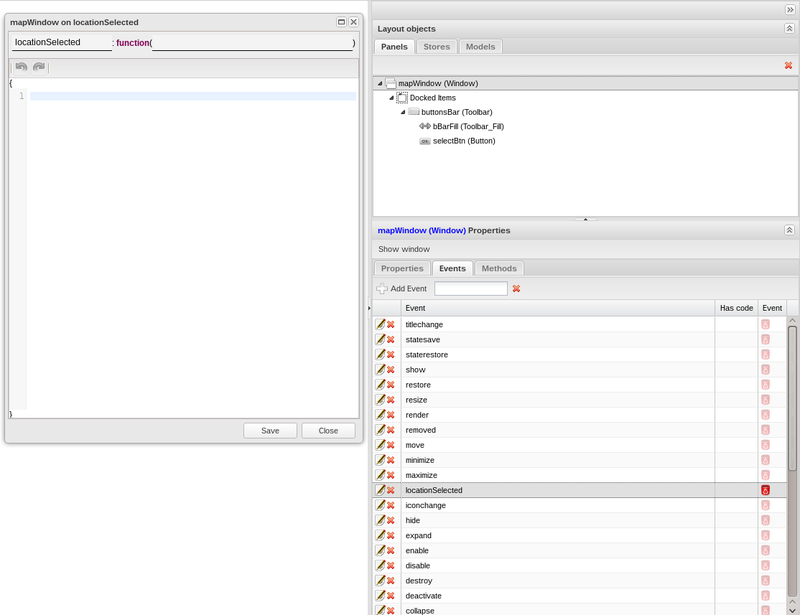 Make sure the embedded project has been successfully connected - click the Related project items button, which opens the list of connected subproject components and their structure. 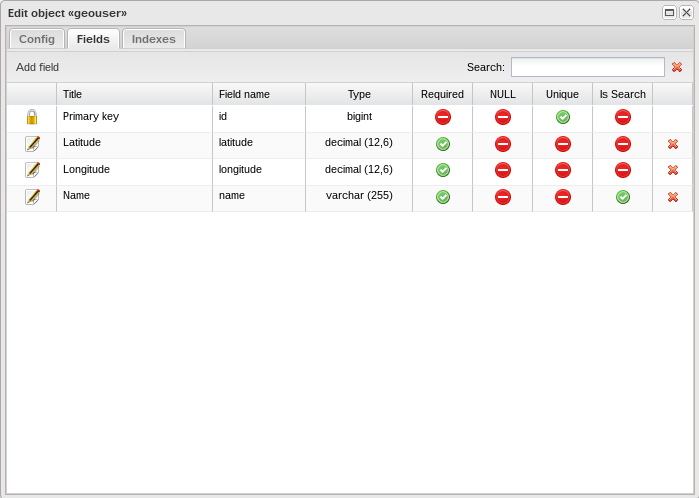 Now, update the user management window so that coordinates can be inserted from the Map Component. First of all, indicate readOnly:true property for the editWindow_latitude and editWindow_longitude fields. Add Form Field ->Field Container component to editWindow_generalTab, name it locationContainer and specify the layout: hbox property. Add another Field Container to locationContainer and name it cordsContainer. 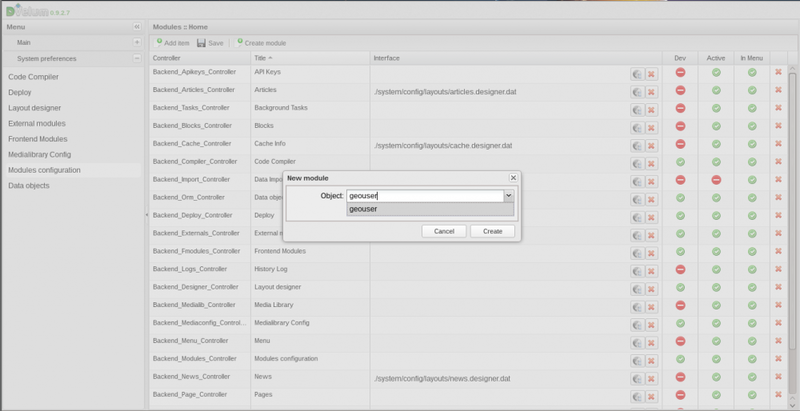 Move the editWindow_latitude and editWindow_longitude fields to the container (cordsContainer). Add Button to editWindow_generalTab, name it setLocationBtn and set the text: Set location property. All that remains is to define the action to the click event for setLocationBtn button.